Last week was marlin week. Any time I catch a wonderful sport fish like a marlin, the event merits an interruption in my blog schedule. This week, we’re back to the creation of my new desk. As you can see, it’s a messy process. 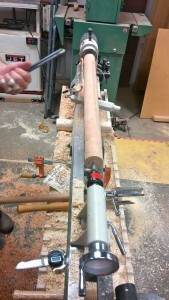 The woodworker, Scott, called to say that he had finished the joinery. He has all the legs ready, and he’s shaving them from square to round before shaping them into their final profile. 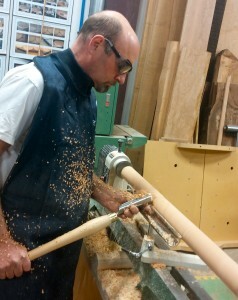 I was his excuse to buy a lathe (yes, Ranchman is jealous), and he demonstrated it today. It reminded me of the edit process, in which I start with something I think is the basis for a good manuscript and then whittle madly to make the story lean and mean. As I watched Scott, I recognized a fine touch. He braced his body to ensure that he didn’t take off too much, or gouge into what would become the leg on a contemporary Biedermeier piece. If you look closely at the photo to the right, you see the metal slide in which his left forefinger moves to ensure that he applies even pressure as he glides his tool down the wood. It’s almost as if he’s dancing carefully, the machinery his partner. And in a way, since human and machine are creating this desk, they are partners in the project. He’s inserted blanks in the top of each leg, where pieces of the writing surface will fit. 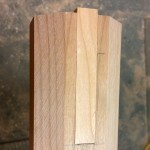 The blanks will stay in place until the legs are perfect. 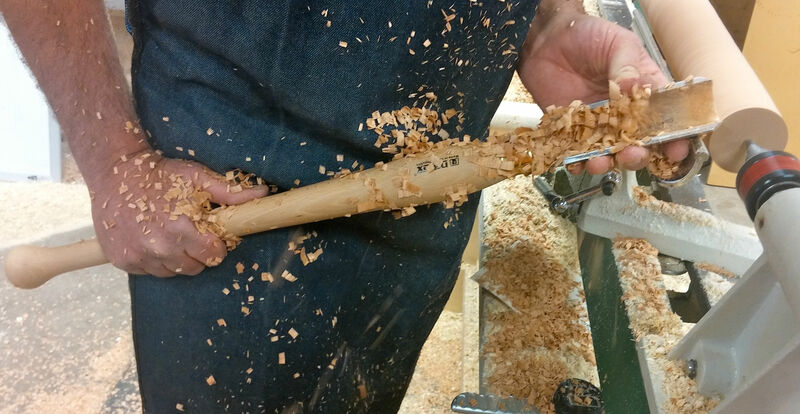 If he tries to put the legs on the lathe without the blanks, the slots in the wood might burr, and he’d be starting all over again. It’s exciting to watch this project unfold, just as it’s exciting to be drafting the next manuscript. I’m more than 10 percent finished, and if I can maintain this meticulous pace, I’ll have a complete draft in May. Most of this manuscript will be written at my new desk, the first NEW desk and commissioned piece of furniture I’ve ever owned. 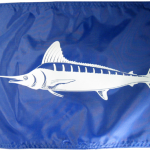 What is it about a marlin? Hemingway fixated in The Old Man and the Sea. Anglers regard the species as part of a Holy Grail that includes the chinook; a tarpon; any sea-run brown off the Tierra del Fuego; and a tail-walking steelhead (“the fish of a thousand casts)” caught spey casting while wading the Deschutes. 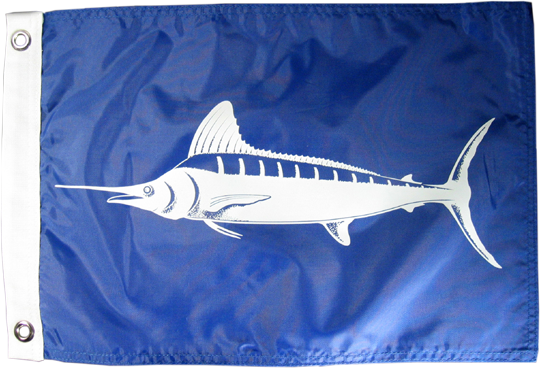 Striped, black, white, or blue, a marlin is angling braggin’ rights. In my dreams. In six months, I’ve lost one parent and settled the second in assisted living a thousand miles away. I’ve sold a house, executed an estate, distributed belongings, and seldom been home more than two weeks in a row. This trip, scheduled a year ago, was supposed to be a break from a frigid winter on my mountaintop. Instead, it was a communications marathon with doctors, nurses, assisted-living employees, lawyers, and adult children. 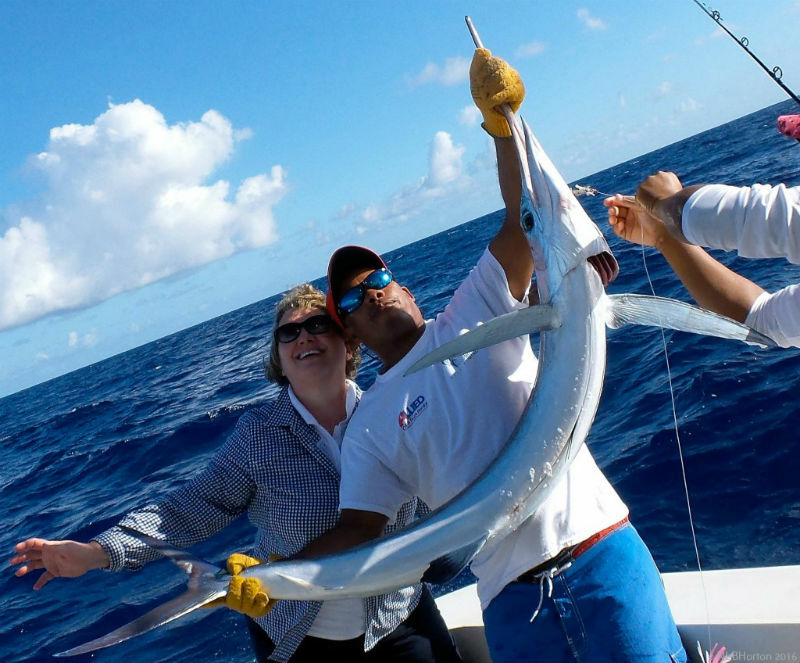 When we boarded the boat for deep-sea fishing, I wasn’t at my best. Saltwater fish get large (duh). I haven’t been working out because I’m either doing eldercare or recuperating from eldercare. And although I’ve landed a sixty-pound salmon in a river and several thirty-plus pound salmon in the international shipping lanes between the Kenai and Queen Charlotte Islands, I have great respect for ocean currents. I also have issues with . . . seasickness. It was shoulder season for large species, so I encouraged Mr. Wonderful to take the first strike. He brought a vibrant green dorado, which matched my face, to the boat. I watched from the upper deck, content to escape diesel fumes, as he wrestled his catch. The captain sent me to the chair. Moments later, it hit. Hard. The line buzzed as the fish headed for Ireland. Three rods were brought in while the fourth was jammed into the holder. I gripped, braced my feet against the cooler, and reeled for all I was worth. Which wasn’t much. I was dreadfully seasick, facing backward, breathing fumes, rocking sideways. The captain yelled, “Marlin!” and I glanced as it leapt. I was in trouble. 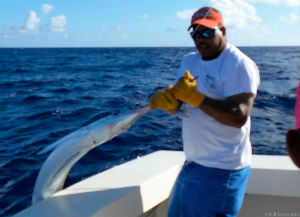 This white marlin didn’t like me. I wasn’t fond of it. I hoped I didn’t throw up all over the rig and thought I might have to try to hand the rod to my husband: ANATHEMA! The fish cleared the water in an arc, and I reeled while wondering if this was going to end well. My triceps and biceps reminded me of the dusty free weights on the office floor, but I kept steady pressure on the lunatic acrobat with fins. Stupid fish. I kept reeling. The marlin jumped, ran, and misbehaved. The captain adjusted the position of the boat. My husband muttered about lucky anglers and asked for something that would cut the thick monofilament line uniting me with my fish. For twenty minutes, I forced myself to focus only on the fish and forget the rest of my world. 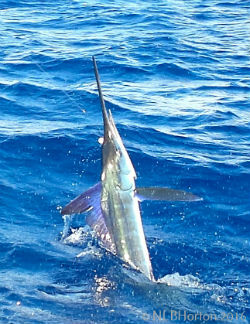 After one last leap near the boat, we tugged the marlin over the side, snapped photographs, estimated nearly seven feet (including bill) and sixty pounds, and threw it back into the Atlantic. I stumbled up the stairs, then chummed the boat from stem to stern, fore and aft, side to side, and over the river and through the woods. Although not as epic as Hemingway’s Santiago, the marlin escaped to be caught another day as a fitting end to the battle between this old woman and the sea.